To import contacts you can navigate to the contacts list page and click “import” found on the Import/Export panel. You can import contacts directly from a CSV or Excel file, Outlook, or vCard. Keep in mind, if you have contact files from more than one source, you will want to import the data where the most detail exists first. The import process will skip duplicates so you want to ensure the details exist in the first import for contacts that may exist in multiple sources. 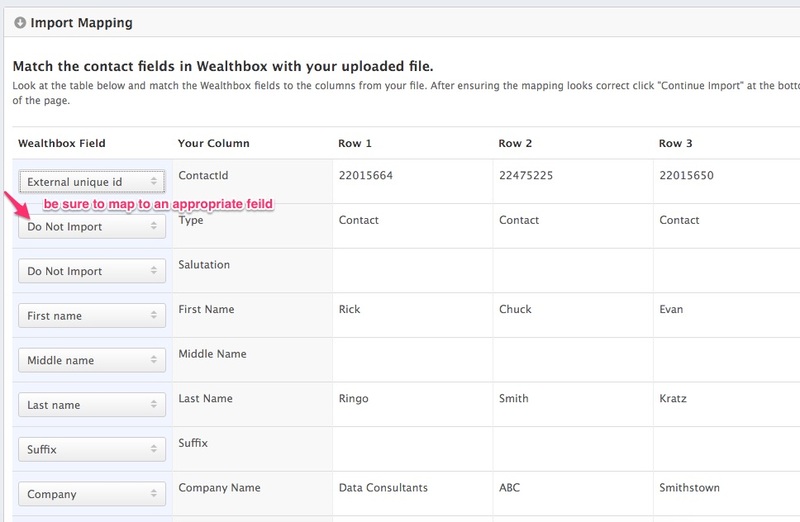 After you have uploaded your file, a mapping page will appear allowing you to map the fields from your file to the fields in Wealthbox. Note: Some fields may be notified and mapped to a field for your. Check that all fields have been appropriately mapped and be sure to map the fields that were not identified or they will not be imported.